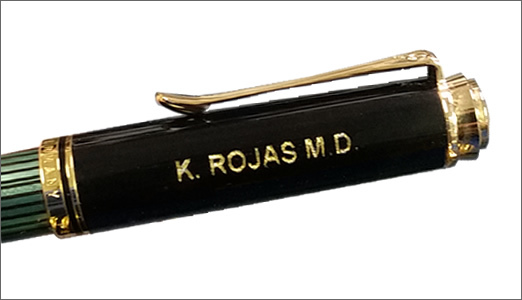 Pen engraving is a great way to personalize a pen for yourself or as a gift. Engraving makes great corporate gifts for an executive, staff member, or a business associate. What better way to say thank you than with a personalized fine writing instrument. Engrave a name, signature, or your company logo on most items we carry for just a few extra dollars. Whether you need just one pen or multiple pens we have you covered. Block font in ALL CAPS. Block font in both upper and lowercase. Script font in both upper and lowercase. Custom logo or other design. Some pens engrave better than others. When a pen is engraved we cut into the surface of the pen. 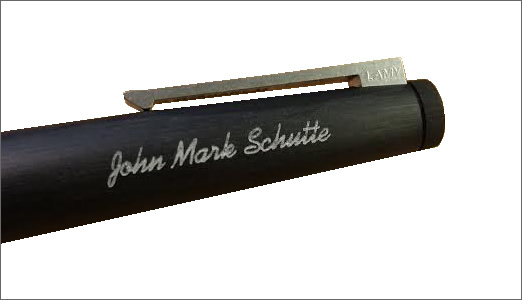 Depending on the material the pen is made from that engraving creates different results. For instance when cutting into a metal barrel pen there is a coating that is a different color than what is underneath. As it is engraved the natural color of the metal shows through. If the pen is made of brass the gold color shows. If it is steel then the silver color shows. The advantage to metal barrel pens is the engraving is permanent. For these reasons, metal barrel pens are the best options for engraving. Occasionally metal pens do not have a color coating such as with a sterling silver pen. When these metal pens are engraved the engraving is the same color as the pen and has little color variation. Resin barrel pens can also be engraved but the process is slightly different. When engraving on a resin pen the interior color of the pen is the same as the surface. To fix this the engraver fills the engraving with gold, silver or white material so it stands out. These fill materials are durable and made to last, rarely needing to ever be refilled. Order is simple. Each item will have an "Add Engraving" button. Simply select that button, select the font type and enter your text to be engraved on the pen. If you need assistance with a custom engraving such as a corporate logo contact one of our friendly staff and we can assist you.